[S00110] 1870 United States Federal Census, Images reproduced by FamilySearch, (Ancestry.com Operations, Inc., 2009), [database online]., Otsego, Otsego, New York. [S00131] 1880 United States Federal Census, Ancestry.com and The Church of Jesus Christ of Latter-day Saints, (Ancestry.com Operations Inc, 2010), [database online]., ED 122, Springfield, Otsego, New York (page 8 of 26). [S00128] 1900 United States Federal Census, Ancestry.com, (Ancestry.com Operations Inc, 2004. ), [database online]., ED 42, Frankfort, Herkimer, New York (Page 45 of 54). 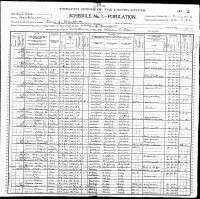 [S00012] 1910 United States Federal Census, Ancestry.com, (Ancestry.com Operations Inc, 2006. ), [database online]., ED 5, Frankfort, Herkimer, New York (Page 9 of 40). [S00121] 1860 United States Federal Census, Images reproduced by FamilySearch, (Ancestry.com Operations, Inc., 2009), [database online]., Otsego, Otsego, New York.